The US economy was strong in 2017. Trump’s claim that two million new jobs were added, is right. Of course, job growth was good leading up to his inauguration, so he shouldn’t be taking credit for the entire year. What’s not right, is that the economy was terrible under Obama, and he somehow turned things around. It was a terrible economy in the last year of Bush’s administration, and aggressive action by both Bush and Obama helped the recovery. I just go by the Bureau of Labor Statistics, to make my point. Trump’s monthly average gain of 171,250 new jobs doesn’t look too good, nor does the 2 million new jobs stand out against Obama’s administration’s numbers. The housing bubble (2004 – 2006) produced some high gains, but it all came crashing down in 2008 to 2009. The stock market made an all time low in March 2009. 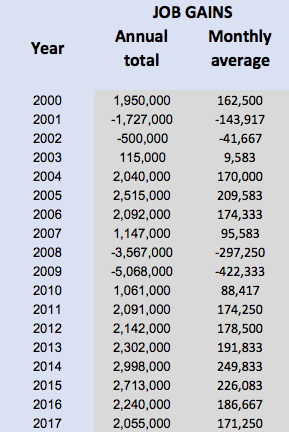 It took time for our economy to recover, as there was only a 1 million job gain in 2010. But, our economy has proven to be much more resilient than economists were predicting in 2007 to 2009. The December 2017 labor statistics just came out with 148,000 new jobs, well below the 190,000 estimate. The stock market continued its rally, based on the concept of a slowing economy discourages the Fed’s program of gradual rate hikes. Or another words, some bad news is actually good news to the stock market, just so long as it isn’t terrible news. I’ve included one link as posted in Yahoo – Finance, entitled “Challenge for Trump: Job Growth is Slowing” which adds a bit of reality to the whole story. We likely attributed too much to actions of an administration, as the factors influencing growth (good or bad) may take years to develop. The housing bubble was at least seven years in the making (includes both the Clinton and Bush administrations). Also, an unemployment of 4.1% is considered a good number, and attempts to stimulate the economy further puts pressure on wage growth. So, the chief concern is that inflation will increase more rapidly than wages, so many workers will feel their spending power reduced. Not good for retail, and ultimately this could lead to a recession. In this case, the reduced corporate tax rate will help in reducing debt, not expanding businesses. So, Wall Street may prosper at least in the short term, as Main Street suffers. A Crisis in the Debt Ceiling Limit Approval – Again! I know this isn’t headline news, yet. But in two weeks, it will be. I knew if Hillary Clinton was elected, this crisis would happen. With Clinton as President, I knew the House Republicans would use this opportunity to threaten to wreck the economy unless a “dirty” approval was signed into law. A dirty approval contains additional riders outside of increasing the debt ceiling which the President and the Democrats oppose and would under normal circumstances never pass. The threat of sovereign default is used as leverage. This makes most economists cringe. But I thought it would be completely different with Trump in the White House and Republicans in control of both the House and the Senate. Boy was I wrong! Obama and Treasury Secretary Jack Lew went through sheer hell in getting the debt ceiling approved in 2011. There was another crisis in 2013. Treasury Secretary Steven Mnuchin asked Congress to approve a simple and clean bill to increase the debt ceiling limit. He is 100% right. Because expenditures are authorized by separate legislation, the debt ceiling does not directly limit government deficits. In effect, it can only restrain the Treasury from paying for expenditures and other financial obligations after the limit has been reached, but which have already been approved (in the budget) and appropriated. The difficulty in approving this increase, is that it says to conservative Republicans, that they somehow approved huge government deficits. The GAO estimated that the delay in raising the debt ceiling during the debt ceiling crisis of 2011 raised borrowing costs for the government by $1.3 billion in fiscal year 2011 and noted that the delay would also raise costs in later years. The Bipartisan Policy Center extended the GAO’s estimates and found that the delay raised borrowing costs by $18.9 billion over ten years. We are back in the same situation, and this time it could be far worse because of the White House in-fighting. Mike Mulvaney of the Office of Budget and Management undercut the Treasury Secretary’s position by suggesting something truly frightening- using the crisis to force changes to Medicaid. It is a time bomb. There are ways to kick it down the road, but that’s a horrible idea, as it starts discussion of all sorts of ways to frustrate a simple approval. Democrats and moderate Republicans should unite and pass what Mnuchin asked for, ASAP. Mulvaney should just keep quiet if he can. Most economists believe the debt ceiling shouldn’t exist. I agree, as explained in the link. For those who watch Jim Cramer’s Mad Money show, one might thing the coal producers would be the perfect “Trump stock” as the EPA is set to reverse course on air pollution standard regulations, enacted during the Obama era. But coal stocks are not doing well at least in the last 3 months. Since the beginning of 2017, Arch Coal (ARCH) is down 16% and Cloud Peak Energy (CLD) is down 27%. We have plenty of coal resources, but declining demand. See prior post, “Coal Craziness” for more details with links. The decline in employment over the last 70 years or so, is due to a high level of mechanization in the mines as well as less demand for coal. The electric producers will use the lowest cost fuel, and natural gas is a very competitive alternative to coal. The coal industry is not disappearing (sorry Al Gore) but the solar energy industry is likely to be booming in the next 5 to 10 years. Investing in solar energy has been a bumpy ride. I would never think “green energy” and Trump policies go together. But based on year to date, investing in a solar power fund (KWT) would have made about 10%, better than the market average of 6%. Pulling out the international agreements to reduce fossil fuel emissions, and subsidies for the solar industry are among the worst plans of the Trump administration. 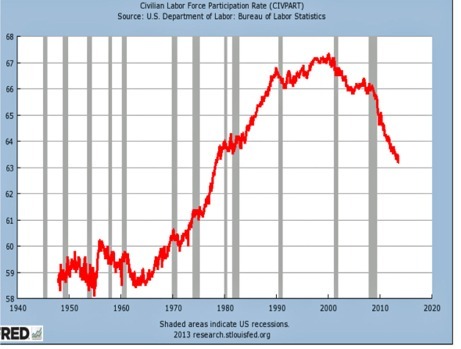 Donald Trump says we shouldn’t believe US unemployment rates is 5%. He says the unemployment rate is really around 20%. The average investor knows 20% is very evident with massive foreclosures and businesses closing up. The stock market is destroyed by even 10% unemployment. The highest level of unemployment in the last 67 years has been 10.8% during Reagan’s administration. Many economic events occurring during Nixon and Carter’s administrations, likely contributed to this high rate. Oil prices tend to go down with unemployment. In the last 4 months, oil prices have been slowly moving up even with an oversupply situation. The unemployment estimates are done by career government employees with the objective of obtaining the best estimate of unemployment in the country. A 5% unemployment rate sounds good, unless you live in a neighborhood where most of your neighbors are unemployed. The 5% unemployment is a nationwide value, and there are large variations depending on age and trade or educational skills. There are other measures of unemployment statistics calculated by the BLS. The BLS has a budget of 618 million dollars and has 2,500 employees. The BLS data are used by economists and financial analysts around the world. In addition to the unemployment rate, they provide estimates of the Payroll Employment, Consumer Price Index (CPI), Producer Price Index (PPI), Productivity, US Import Index and US Export Index. There’s nothing constructive about the debt ceiling. It doesn’t limit spending. It doesn’t limit our debt. It empowers the government to pay its bills. It doesn’t exist in other countries. It is an anachronism. It really should be eliminated because it is being used by minority groups to try to extort from government what they couldn’t do by the democratic process in Congress- like defund Obamacare. The day after Congress refuses to increase the debt ceiling, the US debt will be just the same and be over the debt ceiling limit. Debt increases when spending exceeds revenue. The cure to debt is to cut spending or increase revenue, not plunge the country into economic chaos. If the President continues to pay bills after Nov 3, he and the Secretary of the Treasury are in defiance of Congress and subject to impeachment. If he does not pay the bills, the US is in sovereign default. What have other President’s done in similar situations? Nothing, because Congress has always raised the debt ceiling. It used to be automatically attached to spending bills. “Economic self destruct time bomb” is more appropriate. It has been at the door of congress since March together with the instructions to defuse this bomb – pass the clean debt ceiling increase.